Second edition with incorrect cover print "Philip Boa ! & The Voodooclub" and blue-silver labels. There are another versions of this edition with gold-purple labels and black-yellow labels. The first edition had a different typeface and spelling of the band's name on front cover ("Phillip Boa & The Voodoo-Club !") and blue-silver labels. On this second edition the band is spelled "Philip Boa ! 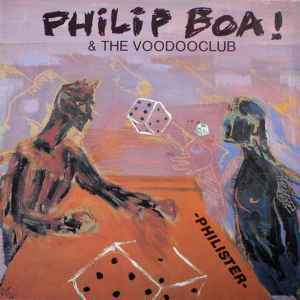 & The Voodooclub" on front cover but "Phillip Boa & The Voodoo-Club" on back cover, labels and spine.